The opposition isn’t going to sit idly by while Trump demonizes immigrants and violates the Constitution. The presidency of Donald Trump has just begun, and already the Resistance has made history. The women’s marches on January 21 were almost certainly the largest act of political protest ever to occur in the United States. Their size, defiant tone, and the fact that they occurred on Trump’s first full day in office put the new president and Republicans on notice: They are in for a fight. Democrats, meanwhile, were signaled that failing to stand against the extreme right’s agenda could carry its own political costs, including challenges in the 2018 primary elections. And protest fever appeared to spread following the crackdown on immigrants directed by Steve Bannon, hero of white nationalists, who has emerged as Trump’s most powerful aide. A week after the women’s marches, tens of thousands of protesters demonstrated and swarmed airports in New York, Washington, Boston, Los Angeles, and other cities chanting “Let them in!” after Trump signed an executive order barring refugees and citizens from seven predominantly Muslim countries from entering the United States. 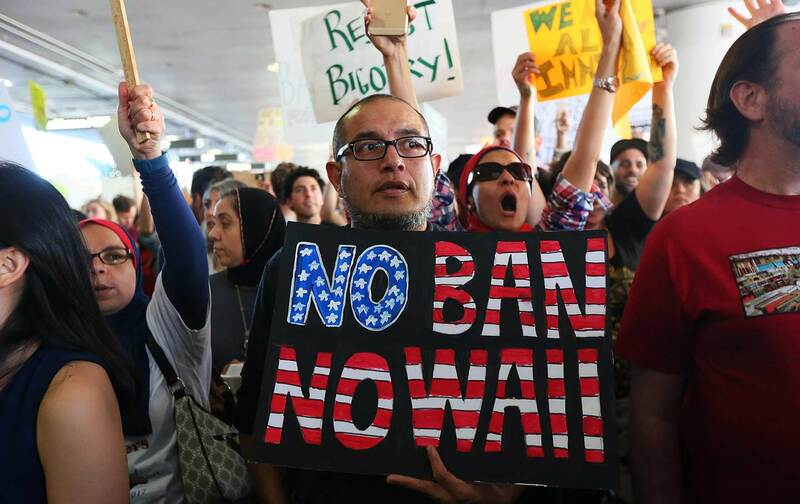 Chaos ensued as people targeted by the ban were prevented from boarding flights to the United States, and those who made it into the country were detained by Customs and Border Protection officers. Federal judges rushed to temporarily halt the deportations, but some border agents ignored the judges and kept trying to deport people anyway, even after four members of Congress confronted them face to face at Virginia’s Dulles Airport. “We have a constitutional crisis today,” Representative Don Beyer (D-VA) wrote on Twitter. Standing up to the bully in chief takes courage, but numbers help. Standing up to the bully in chief takes courage, but numbers help, and the numbers protesting Trump’s first 10 days were massive. The Women’s March on Washington ranks as one of the largest protests ever held in the nation’s capital. Over half a million people marched on the White House, according to official estimates, and eyewitness observations by this reporter and others suggest that the true number was closer to 1 million. Add to this the huge turnouts at marches in New York, Los Angeles, Chicago, the Bay Area, and 600 other cities and towns. Combined, the number of people who took to the streets was anywhere from 3.3 million to 5.2 million, according to political scientists Jeremy Pressman of the University of Connecticut and Erica Chenoweth of the University of Denver, who compiled data from media coverage, official reports, and organizers’ claims. Even their low-end estimate of 3.3 million makes the January 21 demonstrations the largest mass protests in the 240-year history of the United States of America. What this outpouring of anti-Trump sentiment portends for the battles ahead—and how to turn it into ongoing political power—are essential questions to analyze and debate. But first things first: If the opposition indeed manifested the biggest political protest in the nation’s history, this achievement must be stated clearly, recognized widely, and claimed as a victory by the forces that made it happen. Such a public declaration is imperative not only because putting more people in the streets than ever before is by definition a historic achievement. It’s also because this achievement illuminates the new balance of power and possibilities on today’s political battlefield. One thing is undeniable: The popular opposition to Donald Trump is big—very big. More important, the protests of Trump’s first 10 days showed that a significant portion of the opposition isn’t going to sit idly by, grumbling in private, while Trump demonizes immigrants, violates the Constitution, ravages the environment, and more. Organizations like Planned Parenthood, the American Civil Liberties Union, the Council on American-Islamic Relations, and Greenpeace have not only received tens of millions in donations since Trump took office; they’ve also seen a remarkable surge in the numbers of people looking to get involved. These are people who are rising up and will take to the streets. They will become part of the Resistance. And in so doing, they will convince countless others to join them—to take the critical step from passive opposition to active resistance. As one protest sign in Washington urged: We Outnumber Them—Resist! One oft-heard chant at the Washington march warned Trump that this was only the beginning: “We are not going away! Welcome to your first day!” Four days later, Greenpeace made good on that promise by unfurling a giant yellow banner on a construction crane above the White House with black letters exclaiming “RESIST!”—an instantly iconic image that Greenpeace is printing on posters and flags to display in windows at home and wave at the next rally. Three days later, the tens of thousands who protested and rushed to airports to battle the Muslim travel ban demonstrated that large numbers of people are ready to put their bodies on the line to call out authoritarianism and to defend American values and their fellow human beings. Trump, Bannon, and the rest are proving to be as hateful and dangerous as suspected, but the grassroots backlash they’ve provoked could be their undoing. Shrewd rulers never like to see large numbers of people turning out in the streets against them, and for good reason. It creates all kinds of problems; if continued, it can even help bring them down. Just ask Richard Nixon, or the old communist bosses of Eastern Europe, or tyrants throughout history. In Trump’s case, the massive, self-confident resistance now unfolding is precisely the kind of thing that gets under his notoriously thin skin. It’s also the kind of thing that, if sustained, can push a rookie president into making mistakes—overreaching, getting distracted, and alienating allies or the undecided. An unmistakable roar of resistance has sounded across the land, and it shows no signs of going away. On the contrary, masses of people appear eager to take to the streets again and again, for however long it takes to get the job done. Feel the power. And get ready for Act II, and beyond.